Yes, Napoleon Dynamite had skills on the tetherball court. On many lonely schoolyard playgrounds around the country stands a tetherball pole. Perhaps you grew up playing this game during recess at elementary school. I certainly did. On “white flag” recess days (when we could not leave the blacktop due to soggy conditions) I would often play this game with my peers. In case you have never played this game before, let me describe it for you. Tetherball is a game where two individuals or teams stand on opposite sides of a single metal pole with a ball tethered to its top via a string. Each player hits the ball with their hands in opposite directions. The first player to get the rope attached to the ball wrapped entirely around the pole is declared the winner. In tetherball, the pole is central, not just positionally, but in purpose. Everything is attached to the pole and everything revolves around it. As I was reading Ephesians 3:1-13 today, I was struck by the feeling that life is like a tetherball game. In this life, we are beaten back and forth many times by circumstances and struggles. We go round and round like a ball hanging on a string trying to “win” in life. However, in this analogy, what is the pole? What is it that we are tethered to and revolving around? As Christians, our theology informs us that the correct answer to this question is God. After all, the Westminster Catechism begins with the statement “Man’s chief end is to glorify God and enjoy Him forever.” We know that is the answer that we “should” say . . . but is that really how we most often understand life? I would propose “no.” My reasons for thinking this have to do with my own experience. Many times I approach my life from the perspective that my own glory and happiness are the central “pole” I am tethered to. All too often, I try to make sense of all the events of the world with me at the center of that event. When something awful happens in your life, do you most commonly assume that the experience is primarily for your benefit or development? Is your first question, “how is this struggle/hardship making ME better/holier/deeper?” If so, then perhaps you are looking at life with your glory at the center. When something awesome happens to you, do you most commonly assume it is for your benefit or development? If so, you may be living life with yourself at the center. Now, God certainly teaches us things through our struggles. It is a biblical notion that hardship produces in us character (James 1:2-4), thus making us “better.” And certainly there is nothing wrong with enjoying the blessings (material and otherwise) that God has given us. However, I am increasingly convinced that a big reason why so much of the world does not make “sense” to me is because I have the wrong pole at the center of it all. Take the life of the Apostle Paul. Paul was a man that God used to accomplish a very important and strategic ministry in the first century. Paul was used by God to write half of the New Testament, and plant and encourage churches in some of the most strategic cities in the world. However, Paul’s life also had plenty of hardship. When Paul wrote the book of Ephesians he was under house arrest in Rome awaiting trial . . . an arrest that came specifically because of his insistence to share the good news of Jesus Christ with a Gentile audience. In both Ephesians 3:1 and 13, Paul makes reference to his imprisonment and hardship. If Paul’s happiness was the central pole upon which his hope was tethered, this imprisonment would not have made sense. Surely God could have made Paul “better” through many other means than imprisonment. Paul’s arrest does not make sense if Paul is the pole. However, if God and His purposes are at the center, the story has eternal purpose. Paul’s fidelity to the task in the face of persecution makes God’s name great and validates the authenticity of the Gospel itself. Further, his willingness to go to prison results in “glory” for the Gentiles, allowing them to relate to God in this life (Ephesians 3:13). When tethered to a different pole, Paul’s life gains clarity and focus. I don’t know what hardship you may be going through right now that might be leaving you disheartened, confused, or angry. I certainly have things in my life that produce these emotions in me as it pertains to my relationship with God. As we deal with these emotions, however, we should not simply try to beat the circumstances back and forth in a fashion that “wins this game” by wrapping it around our own happiness or development. Our lives are truly tethered to a different pole. Perhaps God is making His name great through our struggle, or reaching another through our hardship. We may not even know for sure WHAT God is up to in moments like these, but we can be certain that when our lives are tethered to Him, we ultimately will win . . . because we are on His team living within His eternal purpose. In the meantime, as we are beaten about in this life, we are not left empty-handed. Remember, we are blessed with every spiritual blessing in the heavenly places (Ephesians 1:3). This means that even if this life is tough, He will still take care of us now, and will usher us into glory later — seating us with Christ in eternity. We can “enjoy God forever” and bring Him glory, even if today does not make sense. Don’t live your life as a lonely pole. Tether your hope to Him. 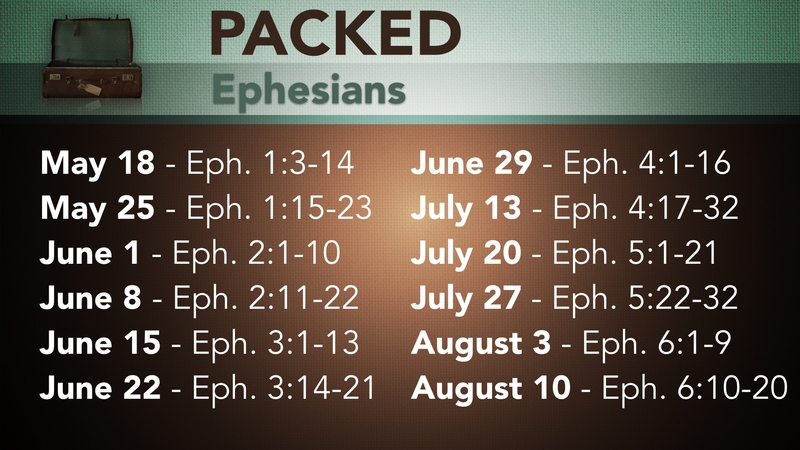 This Sunday, I will be exploring more of this concept in our main worship services at 9:30 and 10:50 at Wildwood Community Church in part 5 of our “Packed” sermon series from the book of Ephesians. We hope to see you there!